Lighting: Yellow-tone amber lights are my favorite and I've always thought a single color light is far more glamorous. The lights in this picture are actually shiny, so maybe they've dipped them in glitter. I had a friend try this on her small tree it was amazing. Just apply some glue to your lights and dip them in glitter. Ornaments: There is no doubt ornaments should bring a personal touch to your tree but that's no reason why your tree needs to lack design. The way you can create this balance through color and shape. If you have ornaments that hold personal significance to you, capture the same colors throughout the tree so that everything compliments each other. Also, select several staple ornaments with this same color scheme but that have a uniform look to them. 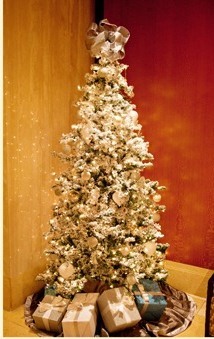 This will highlight your personal ornaments while bringing a beautiful cohesive look among your entire tree. Presents: I absolutely love the presents positioned around the tree. Using the presents as a design piece can be motivating to finish your Christmas shopping early while still adding a critical design piece for your Christmas tree. Don't underestimate the power of wrapping paper and ribbons in creating a complete look. 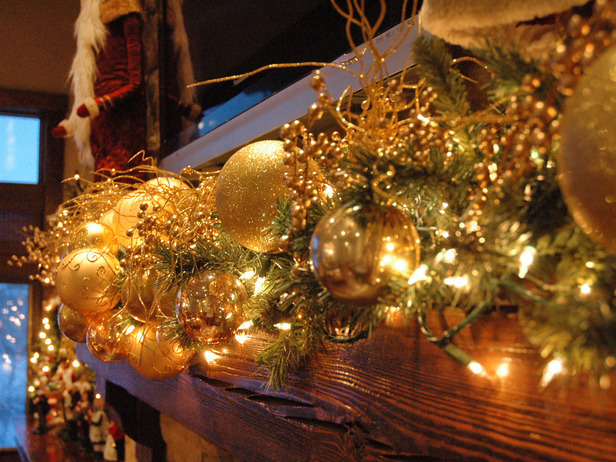 Use complimenting colors to your ornaments and don't forget to accessorize with ribbons and bows. Where do I begin with this look? 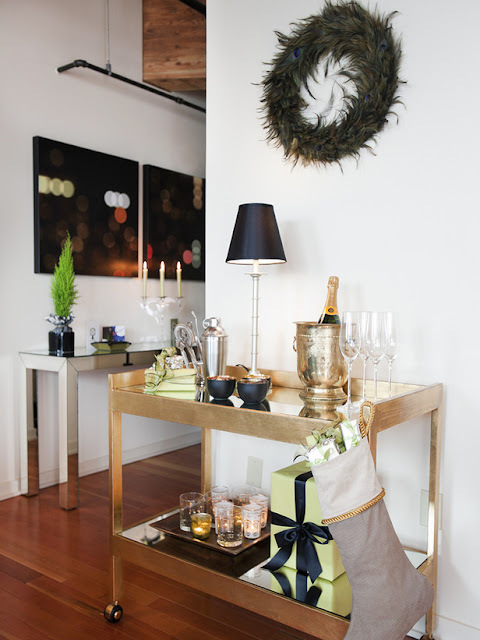 One of the easiest holiday decorations taboos is to get caught up and over-decorate making it look messy and overdone. The minimalist style in this photo is perfection. The wonderfully positioned feathered wreath, present and stocking all compliment each other so well. The candelabra in the background is the perfect touch with the pinch of greenery. I am definitely using this picture as inspiration for our dining room area. This is a perfect marriage between Christmas decor and functionality for entertaining. While we can't hang garland on a fireplace anymore (alas, the one and only thing I miss from our old condo), this picture is important because of the color statement. My love of metallic is showing through yet again, but I don't think there is a better look that screams "Christmas time" than something that glows. I'll continue using the gold and silver metallic theme in our decorations from yonder and bring in a red accent color when it works. But I love the varying size ornaments and garland. A traditional Christmas look with a twist. We're back to a very traditional look but it's the amaryllis' that jumped out at me in this photograph. 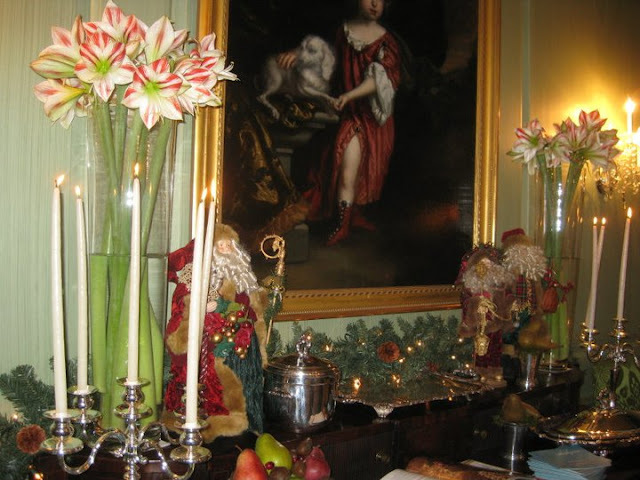 They bring such a pop of color and grandeur to an otherwise classic Christmas look. 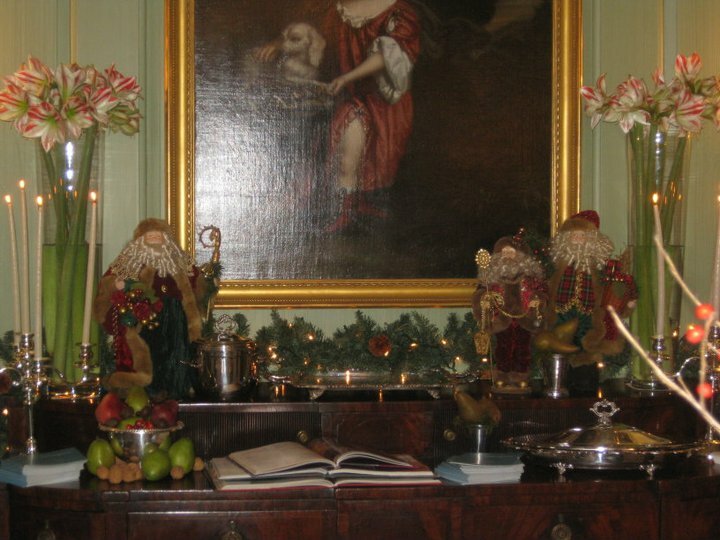 This is another Christmas design example that I think can be really fun in your home...melding old and new either through accessories, ornaments or even flowers. While an amaryllis can be a traditional looking flower, the long stems showing through the contemporary vase and the way they serve as bookends to the entire design makes them appear much more glamorous. I will definitely be heading to the flower market for amaryllis stems this year. Finally, no Christmas look is complete with stockings. And don't think you need a fireplace to complete this look because our media stand is going to serve as the substitute for us this year. You can find many other ideas at this Apartment Therapy blog post. 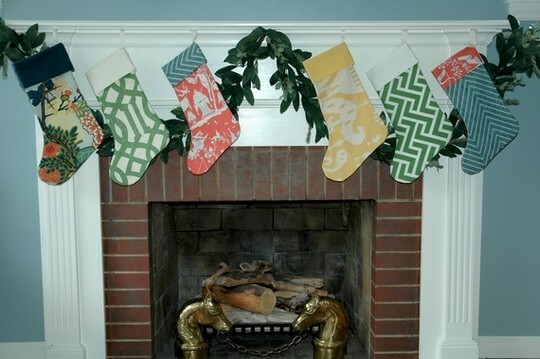 The thing to remember is use the colors and shapes of the stockings to compliment your entire decor theme. What I love about the stockings in this photograph is the geometric shapes themselves are serving as the design piece. No sparkle, ribbons, or type of fabric is needed. or even relevant for that matter...the patterns themselves make the statement. It's like putting pillows for your fireplace! There are a lot of different directions these pictures can take us but hopefully each has a detail that will inspire you and make that wow-factor for entertaining this holiday season.